Looking for a unique, intimate venue for your special day or special event? The Sea Meadow Inn is happy to provide our traditional Cape Cod bed and breakfast as a small wedding venue! Cape Cod is one of the most beautiful and sought after places for those looking to have a destination wedding. With pristine beaches, serene landscapes, and world renowned sunsets -- you are guaranteed to look back on your wedding photos with fond memories. The best part about choosing the Sea Meadow Inn for your small wedding is that we will work with third party wedding planners and event design companies to ensure that the event space fits your color scheme or theme. Previous weddings have focused mainly on incorporating the natural beauty of the surrounding landscape and seascape into some aspects of their decor and ambiance. Whether this be a delicate arrangement of seashells or bouquets made from local flowers -- the design possibilities are endless! We can also recommend you to local florists, furniture rental companies, bakeries, and stylists -- all of whom are ready and willing to make sure your special day goes according to plan. Make a big impression on your guests by choosing a small yet intimate wedding venue for your big day. 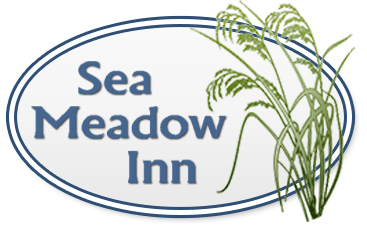 Contact the Sea Meadow Inn online or give us a call at 508-896-2223 for more information and to inquire about our additional capabilities.